Certainly no union bashing here. Just a frank acknowledgement that, in this instance, the interests of the unions seem in direct conflict with the greater good. Not their fault but in conflict nonetheless, and given Noreen's history with these unions, she appears inclined to vote her special interest at the expense of the rest of us. I have not yet seen or heard her confront this blatant conflict in anything but evasive language. When I've heard Lynda respond to questions about the unfunded pension obligations, I heard an honest declaration that it is both sensitive and confounding, and will require a willingness to make difficult choices and the political will to execute those choices. No magic bullet, just conviction, which Noreen doesn't seem to possess on this issue. Contrast her response to that of Tom Lynch and Lynda on the video of the Graton town hall that Barry has posted on this site. I find your claim that you are not "union bashing" disingenuous . Your own words belie your intent. First of all unions are not as you call them "special interests". We are Public Interest. And unlike real estate pacs and gravel mining interests supporting Lynda Hopkins who lobby and participate in politics for the profit driven motives, our unions fight for better conditions for ALL the working class. That's why our union SEIU1021, fought and won paid sick days for all workers so they don't have to choose between a sick day for themselves or their kids and losing a days pay. That's why we spend our money and time and resources fighting for 15$ an hour for all workers in Ca. And we were successful in getting this critical wage increase for working people passed. In the past we have fought and won the Equal Pay Act, the FAmily Leave act and many other policies that help all working people. We have done this all the while fighting against the Chamber of Commerce and The Sonoma Business Alliance who continue to lobby for policies that hurt the working class. And we fight for pensions, decent wages and health care because we believe all workers and indeed all people deserve this. Working people do most of the taxpaying and bill paying and community building and we deserve to have a dignified retirement. Your pension bashing and anti labor comments have no place on a so called progressive and environmental bulletin board. 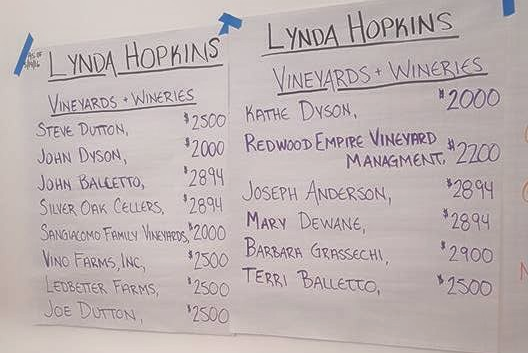 Those of you like Tom Lynch and the big wineries and developers behind Lynda Hopkins don't care about workers or our community and are happy to turn Sonoma into another Marin where only the rich can afford to live. And they are happy to hate on pensions and labor unions and people who work for a living on behalf of the Good Old Boys in this county who who care more about exploiting the land and the working people to further their own selfish interest. If you want to keep pushing working class people out of the country and onto freeways where they have to commute longer and longer because they can't afford to live where they work then by all means vote for Lynda Hopkins and keep bashing unions. And let them turn this county into a playground for the rich wine snobs - cause that's where it's going. If you want to stand with environmentalists and real progressives and the working class then vote for Noreen Evans who is not afraid to stand with working people. I will respond to Lisa's old tired rhetoric later, for now we have a new breathtaking milestone in BOUGHT BY THE BOOMERS (Great title for a TV show---more ideas later :). Needless to say as Supervisor I will represent ALL retirees and future retirees, as opposed to the current first wave of boomers who have put it all at risk (of course I will represent them as well). As a real Democrat I will also strive to restore all the programs cut with five fold increases in boomer pensions, and corresponding cuts in all the programs we used to have to protect the least of thee among us (but I digress). Check it out, it's truly amazing, I challenge anyone to give me an example of a PAC (Political Action Committee), that has ever paid before a primary election $50,000. Somebody's poll numbers must be dropping dramatically...stay tuned...records are being broken as we speak. I retract my withdrawal of calling you a Bosco Boy. I think you are just a tired old capitalist DINO hungry for power. Noreen is quite happy to represent working people, accept donations from working people, and acknowledge it. But I like you, your heart is in the right place on occasion. Last edited by Barry; 05-21-2016 at 11:33 AM. Also, I become uneasy when people start bashing unions. For many decades unions have fought uphill battles for worker's rights, and their power has steadily eroded over the years as the wealthy power brokers and their government supporters have beaten them down. . I've got no problem with private sector unions, to which your quote above refers, but you completely ignore the situation with PUBLIC SECTOR unions, which have no "Big Money" interests fighting to put them down; rather they -are- the big money interest trying to put their pet politician into office to achieve the best deal for their members (who can blame them? not me, but that doesn't mean I want pot holes in the road so they can have giant pensions). Don't you recognize a problem when 20 years ago the pension costs were something like 5% of budget and now they are 20% or more and rising? Don't you see a problem where someone earns their FULL salary when they retire, and sometimes more? Don't you see a problem when they can retire at 55 or 60 and everyone else, whose taxes pay for these salaries, has to work past 67.5 to receive their SSN and a modest (25% salary) pension even if one is available. So: One can say "public sector unions are a problem" without bashing private sector unions or being in favor of "big money interests", just like one can say "I don't think illegal immigration is good" without being against immigrants that follow the US laws to come to the US. Last edited by Barry; 05-21-2016 at 09:15 AM. Just as those of us who are Mexican know that when people say " I'm against illegal immigration not immigrants" you are lying to avoid being called xenophobic; those of us who are union and working class know that the " I'm against public unions" canard is just a smokescreen for being anti- union. It's obvious and no one buys it. ... you are lying to avoid being called xenophobic; those of us who are union and working class know that the " I'm against public unions" canard is just a smokescreen for being anti- union. It's obvious and no one buys it. First: ad hominem attacks are extremely unbecoming. I am not lying. I am not xenophobic. I have no agenda against immigrants. Do you advocate completely open borders? Do you advocate that anyone, who, by any means, makes it to US soil, should be allowed to stay with out any condition or restrictions? If so, at least be honest about it...some people do take that view (not related to West County, of course, where development isn't allowed). But others, including most legislators take the view that a country has a right to control who enters and who stays. One can have that view without being xenophobic. And one can recognize that there is real, demonstrable, structural difference between public and private unions. FDR recognized it. The difference is this (and of course you never address the position, you just attack me): when the people negotiating with unions are put into their position of power by unions, using money extracted from others (like me and other taxpayers) it forms an unholy alliance that puts the structure of society in danger, with results we see in Stockton, Vallejo, and the roads of Sonoma county. Try putting down your (verbal) baseball bat, and instead address the position that I present. If you want to hear for yourself how each stands in their response to the issues that most interest you, check out the Sonoma Independent's just launched easy to access Candidates Video debate here. Last edited by Barry; 05-21-2016 at 10:58 AM. As demonstrated, your union made a $50,000 donation to Noreen's campaign. That, by definition, constitutes a special interest. Also, as a clear minority of the citizenry belongs to a union, whatever the benefits of union membership may be, and regardless of their fine intent and gains for the working class, they do not represent the public as a whole. The idea of depleting the public treasure in the interest of supporting the very few, is not in anybody's interest, union or non-union, and is unsustainable. I ask you, do you believe the current arrangement is for the good of us all and can continue unchanged? If yes, please explain to me how so. If no, how would you recommend we bring it back in to balance. Finally, if there's any bashing going on, it comes from somewhere other than here. First of all- the donation you are referring to is NOT a donation to the Evans Campaign. It's an independent expenditure that BY LAW does not coordinate with any candidate or campaign. It is funded by donations of less than a 100 dollars a year by our workers. It has paid for campaign mailers to inform voters about why we are supporting a pro working class candidate. And not to mention the free media that Bosco and the chamber use (the Press Democrat) to issue propaganda to voters. When do you worry about real estate interests and gravel miners and wineries ( who have millions at stake and projects that will be heard in front of the Board of Supes) buying their political power?! NEVER ! But when the working people in this county try to have say in politics you try to spin it as somehow improper. Please. Your anti union bias is showing. I think you are just mad that voters are able to see behind the " organic candidate" and greenwashing that big business has been doing in this campaign and voting for the real environmental candidate Noreen Evans! You spout rhetoric, slogans and invective, yet, like your candidate, you evade answering simple, relevant questions about the issues confronting our community. Like the oceans, our County is an eco system to be sustained. If we take all the fishes out of the ocean, we starve. If we take all the money out of the County coffers, we starve. The question is about how we sustain this County eco system. Please stop the name calling long enough to answer the questions. No. Financial supporters have put money behind their "endorsement". Since Noreen's campaign has made such a big issue of where Lynda is getting financial support from, I'd like to see a full disclosure of the people and organizations who put their money behind Noreen. 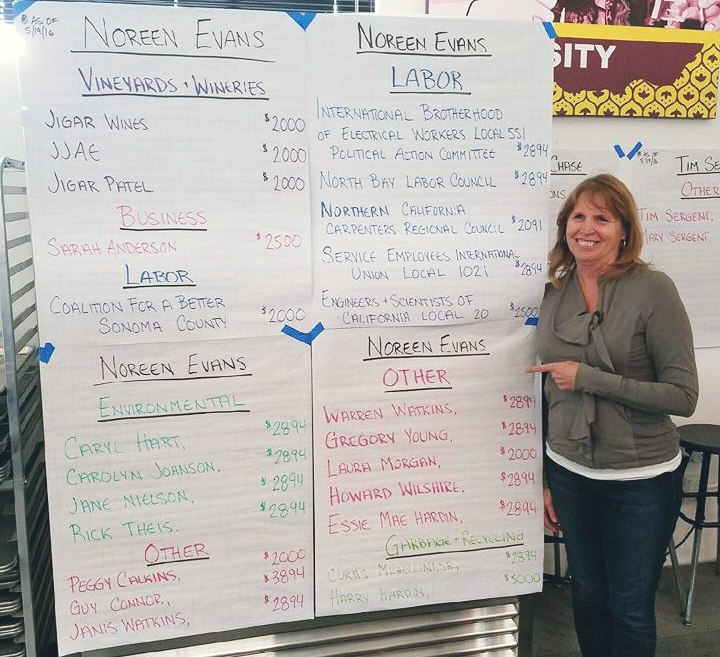 Tom Lynch recently posted that the SEIU contributed nearly $50,000 to Noreen's campaign. It's the same group whose members have benefitted from her vote to raise their pensions without a corresponding increase in funding. Who else has put significant dollars behind Noreen??? This is not a donation to a candidate's campaign. It's an independent campaign from the SEIU. It's our message and our mailers and Noreen has no say in it- positive or negative. Secondly- pensions are not by any means the most urgent and important issue in the district or the county. UNLESS you are Tom Lynch or Ken Churchill or some other right wing Fox News hound. Check with the county' s pension oversight Executive Director at Sonoma County Employeer Retirment Association- county pensions are funded at 80-90%. It is very healthy and sustainable. These are phoney right wing talking points that are raised to distract you from the fact that the Sonoma Business alliance and the Sonoma Real estate and SYar gravel mining and big wineries are trying to buy another seat on the board of supervisors. Just like they do on a National Level they are trying to blame working people for the collapse of our economy when the truth is- it's corporate greed that is killing us. Bernie Sanders recognizes this and Is supporting unions, workers and an economy that works for all. If you want to keep indulging in anti union rhetoric and Fox News talking points on a " so called" progressive website. Then by all means continue. But I stand with Bernie -the problem is the 1% not the 99 and I am done arguing with those who attack workers and defend corporate interests and gravel miners while calling themselves "environmentalist". Let's not forget, the overspending on pensions by the county was the main reason why the sales tax for repairing the roads went down to defeat last year. If Noreen is going to keep contributing to this problem, I have a hard time supporting her. 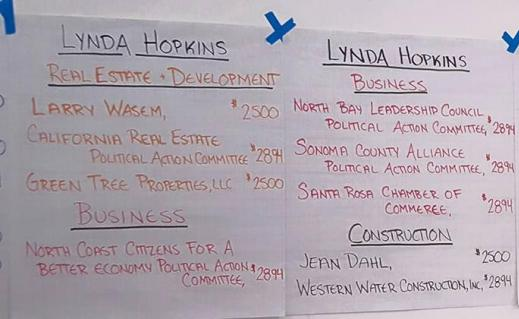 I am troubled by Lynda Hopkins' financial backers, but at least she might make more eco-villages, etc. happen. Things like eco-villages are not really on Noreen's radar. I appreciate all the threads here in waccobb to learn about the candidates for this important position. Barry, all the financial reports are online and publicly available. I will try to find the link again, but it has been posted a few times. 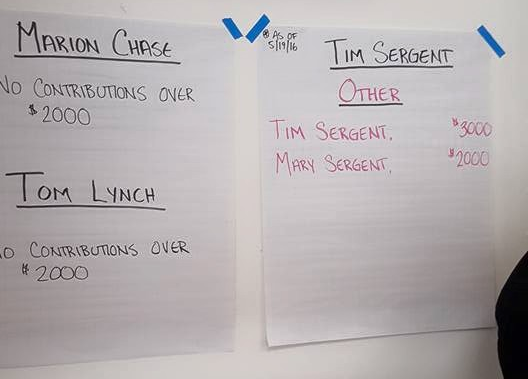 You will find the larger donations come from Sierra Club, SCCA, Guy Conner, Rick Theis, and yes some labor groups. I would sure prefer my candidate be supported by workers groups than big money, developers, real estate and gravel mining. ...Who else has put significant dollars behind Noreen??? Type in the candidates last name. They filed their first quarter reports at the end of April. After that, they have to report any donation $1,000 of more within 48 hours. One recent one to Noreen was from a doctor with West County Health Services. Most of Lynda's recent ones are max-out donations from wineries or heavy equipment operators. Most of Lynda's recent ones are max-out donations from big wineries or heavy equipment operators. Oh and the Santa Rosa Chamber of Commerce. yes they do, although of course Barry's got final word. But one of the emerging themes of our times, not just this election, is that people aren't willing to hear opposing voices. A backlash seems to be starting and it can't come soon enough. I think this answers your question Barry. I saw these going around on Facebook and figured it was pretty telling of who's backing who. I also really appreciate that Noreen seems PROUD of her supporters and not afraid to stand by them. I don't see Lynda standing next to her supporters. Could you imagine what the 5th district would think if they saw a picture of Lynda standing next to these supporters pointing and smiling. What does that say about our two "frontrunners?" When one seems to be proud of her supporters and the other seems ashamed. Lastly, I also think it really says a lot when Noreen has four major environmental contributions, and the "organic farmer" has zero! Last edited by Barry; 05-22-2016 at 09:17 AM. Curious that Noreen's chart nowhere states "S.E.I.U. $50,0000"
More than a little quid pro quo I'd say. Last edited by Barry; 05-22-2016 at 08:15 PM. Um Because there was NO 50k donation to Noreen's Campaign by SEIU1021 . As I have told you repeatedly that was an independent expenditure from us and by us to let voters know who the worker friendly candidate is. It's OUR expenditure campaign and Noreen Evans has no say in it and can not spend it because it is NOT a donation to her campaign. I can't figure out if you are really that ignorant about politics or just being willfully obtuse because it serves your anti-union narrative. In any case I know you will keep spreading the anti union lies here because you hope voters won't notice that Lynda Hopkins being bought by break estate developers, big wineries and Syar Gravel Mining. I've yet to see such a PAC contribution to Lynda Hopkins, though if there are any out there, I'd be interested to know of it. You seem to assume so much about those you don't know but with whom you disagree. I imagine others, like myself, choose to ignore challenging your disparaging remarks and focus on the issues at hand. You assume I'm anti-union, pro-real estate development, pro-big winery interest and pro-big business. Yet I am none of those things. I just hold a different opinion about who will best represent our interests as a supervisor. There are many positions on which I agree with Noreen. I just trust that Lynda would make different choices than Noreen on certain other issues. ...I can't figure out if you are really that ignorant about politics or just being willfully obtuse because it serves your anti-union narrative. Last edited by Barry; 05-22-2016 at 08:16 PM. You seem to label any post that disagrees with you as " hate" " negativity" or "invective"
I am sorry if your feelings are hurt. But you have repeatedly attacked unions and anyone who supports unions, so yes, I call that " anti- union rhetoric." It's true that I know nothing about you except what you say.l That is your choice. I have been absolutely open and transparent . I post under my name and I am proud to work for a union and for the working class. When you post under an anonymous name you can pretend to be anyone. So for that reason in going to decline to discuss politics with you until you post with an actual identity. Otherwise I would guess I am arguing with a winery lobbyist or a shill for real estate. Last edited by Barry; 05-23-2016 at 08:28 AM. Last edited by Barry; 05-22-2016 at 08:17 PM. My first and last names are listed under my profile, and you are welcome to address me by either should you wish. I have absolutely no connection to the wine or real estate industries. I am, in fact, a working stiff myself. I have not made a single statement here attacking unions, and you would be unable to provide one. At its best, open discourse opens minds. That's what we need more of, regardless of positions taken. ...So for that reason in going to decline to discuss politics with you until you post with an actual identity. Otherwise I would guess I am arguing with a winery lobbyist or a shill for real estate. Last edited by Barry; 05-22-2016 at 08:18 PM. I gotta say, I'm with photolite here. I would normally lean toward your side, but usually you're wrapping your legit responses ("it was an independent expenditure.. Evans has no say") with inflammatory lines like "you're that ignorant or just willfully obtuse". Why?? it's not helping make your case, in the current season it sounds like Trumpeting, and I have to consciously fight the impression that your candidate and issues are tied with his. Usually that kind of insult and aggression is intended to bury the issue in emotion and distract from the argument. I don't think that's necessary here - I hope it's just your personal style and isn't reflective of the merits of the argument itself. But it does make me wonder, when before I didn't have the same concerns. Last edited by Barry; 05-22-2016 at 08:19 PM. "Sounds like trumpeting", given who you mean, is not invective? You know damn well Noreen supporters have nothing to do with the trump. maybe you should look at your own negativity. As for Lisa, given the anti-union BS from the right, i can't say I blame her for aggressively defending unions. ...I am proud to work for a union and for the working class. As a former operative master mason and member of the Detroit Cement Masons Union No.714, I will honestly say that I was proud to be a card carrying member of that union. Unfortunately, we now see how well unions preserved jobs for the working class in Detroit. Please fill us in. Are you saying Unions destroyed jobs? I'm honestly ignorant about Detroit, except to say that when the car manufacturing closed, I thought that is what destroyed the economy there. ...Unfortunately, we now see how well unions preserved jobs for the working class in Detroit. Please fill us in. Are you saying Unions destroyed jobs? When the economic vitality of Detroit started to decline with union jobs moving out of state or out of the country though NAFTA, being a working class member of a union was meaningless and served no purpose toward preserving one's job. For clarity, I will exactly restate what I wrote in my previous post; "Unfortunately, we now see how well unions preserved jobs for the working class in Detroit."